Christmas-time Peipsi shore at Kauksi. Glassy ice everywhere. On the shore and at the water’s edge a number of slightly frozen slush balls. 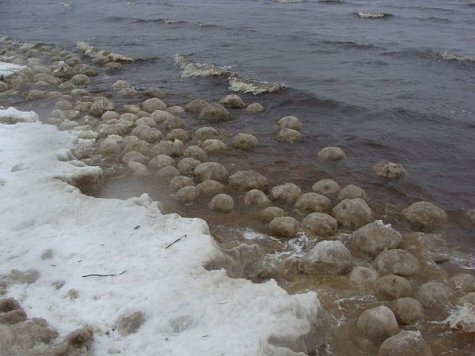 I have never happened to be at the Peipsi shore in this weather before and so have never seen such balls made by nature. Some the size of a man’s head, some even larger. Outer surface frozen, but slushy inside. Shatter easily when dropped on the ground. Winter play of waves and winds . . .